I am so very excited about this! We don't often go out for meals, but things got a little crazy this past weekend. We decided to go to our local Island's for a quick lunch. To my surprise, they happened to be testing out a few new menu items, including their Fresh Beach Bowl. I took one look at all the veggies on there and I knew my little girl would love it! We told her what it was and she was ready to try it out. 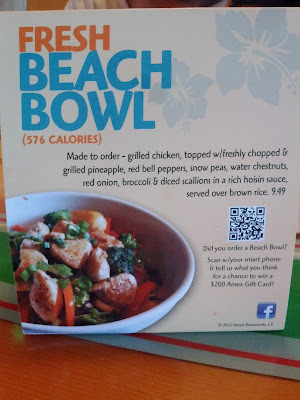 When her bowl came, it looked just as good as the marketing photo. It was also fairly large given that this is on the adult menu. Some of the pieces were a little too big for her, but that was easy to overcome. She LOVED it! In fact, my husband loved it too! (I didn't sample it because of the chicken, but it smelled delicious!) 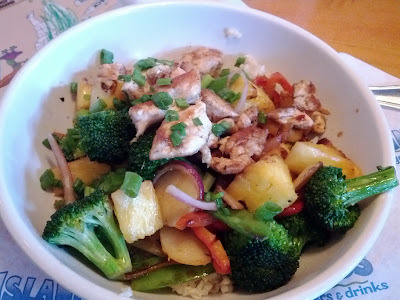 It was a little pricey ($9.49 + tax) - about double the average kids' menu item, but we got 2 meals out of it. I think it was well worth the price to get such a great variety of veggies and brown rice. This item is only in the testing phase, so if you happen to be near one of the Island's restaurants that is testing this menu item (just call ahead to check), please give it a try. I hope this option is here to stay!